The maximum size of the Board of Trustees on the Charitable Company is 16. Three of these Trustees are local Councillors nominated by the Borough Council, representing the three main political parties. In addition to this, there are three Trustees currently serving on the Board of the Trading Company, and they attend the main Board meetings (which take place monthly) but in a non-voting capacity. Trustees may also serve on either the Finance Sub-Committee or Human Resources Sub-Committee. Steve chaired the Rochdale Legal Advice Project, and is Vice-chairman of Rochdale Law Centre. He was a member of the Foreign and Commonwealth Office 2012 Olympic Truce Stakeholders’ Group which met regularly in Whitehall and a guest speaker at the Olympic Truce Signing Event in Westminster Central Hall where he addressed Ambassadors from around the world. He has recently worked as producer on an independent film. Chris joined the Board in 2016. and currently is a Manager in the Deal Advisory team with accountants KPMG. Having trained with the firm as a Chartered Accountant, Chris has subsequently progressed to become a licensed Insolvency Practitioner, typically advising firms who encounter financial or operational issues that need to be resolved, often within high pressured timescales. Working across a range of sectors in both the public and private sector, Chris’ recent assignments include advising a North West NHS Trust regarding cash management and cost reduction plans and the restructure of a national high street retailer. Prior to life in professional services, Chris studied Sport and Exercise Science at Loughborough University and was a national level swimmer and latterly coach at Rochdale Aquabears. Steve joined the Board in 2014, and became the Chair of Finance Sub Committee in 2015. Steve is a Member of the accountancy disciplinary/licensing panel, ACCA. He has served on a number of Boards including as a member of the Heywood & Middleton PCT as a Non-Executive. He was the Chair of a major Housing Association overseeing its transfer from the Local Authority. He was a member of the governing body of the Calderdale PCT where he was responsible member of the Audit Committee ensuring that they always achieved a break-even position. Julia joined the Board in 2016. Julia’s current role is Assistant Principal Finance & Corporate Development at Hopwood Hall College where she is responsible for a range of activity including Finance, HR & Payroll, MI & IT and Marketing and Admissions. Julia is a fully qualified and full member of the Chartered Institute of Public Finance and has worked in the public sector in various finance roles for nearly 20 years, mainly in Local Authorities. In addition she has a keen interest in promoting and playing an active role in the community and has been a trustee of her local pre-school; chair of the before and after school committee and a PTA member along with other volunteering roles in local sports clubs. Julia recently moved to Rochdale from her home town of Oldham. Miah became a member of the Board in 2014. He is the Centre Manager at Wardleworth Community Centre in the borough of Rochdale where he has responsibility for managing a comprehensive activity programme for all ages. He has experience and skills gained from over 17 years of working for private, public and voluntary sector organisations. Miah has a post Graduate Diploma in Housing and also obtained the introductory certificate in management (ILM/NEBS). He has experience in the development and management of a Housing Co-operative in a tenant-led organisation and urban regeneration including practical experience of neighbourhood management, community development, and renewal area works. Janine joined the Board in 2014, and became the Vice-Chair in 2015. Her current role is as a Senior Lecturer in Sports Development at Leeds Beckett University, Carnegie Faculty. Previous to this, Janine worked for RoFTRA (Rochdale Federation of Tenants & Residents Associations) where she had responsibility for the management of community sport projects, young people's projects and health initiatives targeting social housing estates across Rochdale Borough. Janine has been passionate about sport since being a child eventually ending up basing her professional career in the industry. She is enthusiastic about culture more broadly, specifically music and also art and heritage. She has qualifications at both undergraduate and postgraduate level in sport and management, and has over 15 years of work experience in the sport industry. Roger joined the Board in 2014, and became the Chair in 2015. 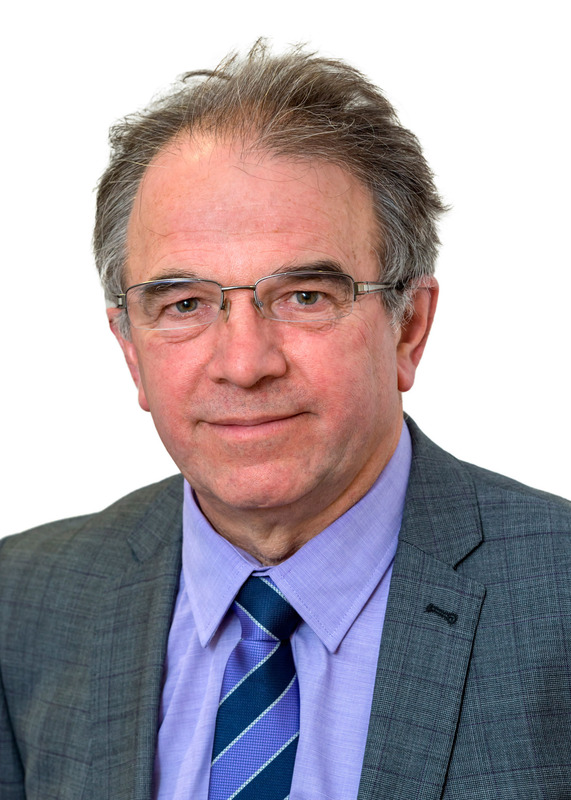 Roger’s current role is Director and Senior Consultant at Joanne Platt Associates, where his responsibilities include; company secretary, financial management, project planning, and project management and development. He has had an extensive career in local government as Head of Tourism Service, where his responsibilities extended to tourism information, box office and merchandising, heritage consultation and liaison with English Heritage both nationally and regionally in respect of community engagement and securing external resources. Mohammed became a member of the Board in 2014. He is the Chief Executive of the Multicultural Arts & Media Centre (MAMC). Mohammed founded this organisation in 1987 in the Rochdale borough and has over this period strived to deliver high quality arts for mental health, media training and festival work. He has a lifelong commitment to the development of training, arts and culture, as a way of raising a person’s health and wellbeing and creating a positive life affirming attitude to our borough. Mohammed has a passion for music, and previously was Music Teacher/Arts Co-ordinator at Cleveland Arts where he has responsibility, as Arts Development Co-ordinator, to develop arts residencies and cultural activities in schools, community centres and colleges and to organise international tours and the Rochdale Mega Mela. An active figure both in her community and nationally Atifa was elected Youth MP for Rochdale in 2005. Whilst still a student in full time education Atifa successfully secured beacon status for healthy schools in Rochdale, created a behaviour policy for local high schools in 2006 and campaigned for a new Sixth Form institution. She is also a graduate of HRH Prince of Wales Young Muslim Leadership Summer School at Oxford and The University of Manchester Leadership Programme. An IT professional and serial entrepreneur she continuously uses her skills and networks to excel and inspire many others to become engaged in building their futures. Anne joined the Board in 2014. Anne was Assistant Borough Solicitor at RBC and was involved in the formation of Link4Life. She subsequently became Head of Business Partnerships and was responsible for the management of outsourced council services (including Link4Life) and for the council’s Procurement and Facilities Management Services. Prior to leaving RBC she was Head of Service Remodelling, leading a team which undertook option appraisals of different methods of delivering council services. She is a qualified solicitor and a member of the Law Society. She is a member of her GP’s practice Patient Participation Group and enjoys pilates, going to the gym and creative writing. Anne has worked in the public services sector since leaving full time education and is passionate about the need to deliver high quality, effective and efficient public services. Martin joined the Board in 2015. Martin has had a long experience of sport, arts and leisure activities, alongside extensive experience of working in the public sector, as a local authority employee. He is a regular participant in sport, including formerly playing regular league cricket, and now competing in many runs from 5K up to marathons. He was a volunteer as a ‘Games Maker’ at the 2012 Olympics and Paralympics in London, working as part of the international team. He has experience of working on sports development, including developing the concept, funding, design and delivery of Heywood Sports Village. Elizabeth joined the Board in 2016. Elizabeth has undertaken a variety of roles within the community including being a Trustee at Petrus and a Governor at Bolton University. She founded and is currently a trustee and vice-chair of Littleborough Arts Festival. Elizabeth has owned a number of businesses including two galleries where she sold her own and other people’s work. She was also a Director of REstore a social enterprise which offered training and support to disadvantaged women in Rochdale. Currently she delivers business advice and workshops to creative businesses in Bolton, where she specialises in marketing. She is also studying at the School of Social Entrepreneurs at Liverpool University with the intention of staring another social enterprise. She has written a number of books about creative businesses and writes for a number of publications. As an artist she is inspired by the Pennines where she lives and regularly walks her dogs. 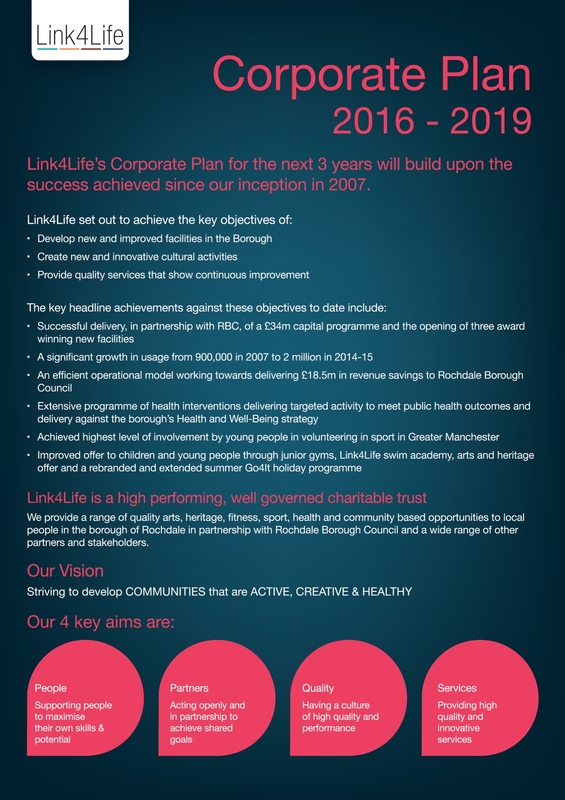 Rina is a Conservative Councillor on Rochdale Borough Council; she is the Shadow Portfolio Holder for Corporate and Regulation and has been a Trustee of Link4Life since 2015. She has worked within the health sector for a number of years and brings this knowledge and expertise with her for the benefit of the organisation. Rina is passionate about the provision of quality leisure, arts, heritage and cultural services to the residents of the borough. Registered Office: Link4Life, Number One Riverside, Smith Street, Rochdale, OL16 1ZZ. Company Registration Number: 6052980. Registered Charity Number: 1118610.